Roselyn Ross Price, 87, Fair Haven Shelby County Home, Sidney, Ohio died at the nursing home on Tuesday, November 13, 2007 at 2:25 AM. She was born October 5, 1920 in Detroit, Michigan the daughter of William Arthur and Eleanor (Cron) Ross. She was married October 7, 1944 to Jack Price and he died July 14, 1988. Surviving are four children, John Ross Price of Holly Hill, Florida, Donald J. Price Jr. of Sidney, Ohio, Gordon W. Price of Celina, Ohio and Mary Price of Sidney, Ohio; eight grandchildren and two great-grandchildren. One brother, William Ross Jr. is deceased. She was a 1937 graduate of Sidney High School and studied at Miami University. 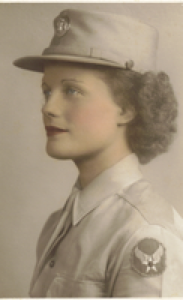 She was in World War II, Army Air Force, Women&#39;s Air Corp. serving her country from 1943-45. She had worked mixing chemicals for a photography laboratory outside of Riverside, California. Later, Mrs. Price was stationed in Washington, D.C. where she worked on preparing maps at the Pentagon. At age 21 and working as a receptionist at Ross Products, the company her father started which is now known as Ross Aluminum, Mrs. Price then decided to enter the service. Her basic training was accomplished at Fort Oglethorpe in Georgia. Fort Oglethorpe got a surprise visitor during her service there. President Franklin D. Roosevelt had come to review the troops and Mrs. Price could see the president clearly. &quot;It was one of the biggest thrills of my life&quot;, she said. From Fort Oglethorpe, Mrs. Price went on to be stationed at March Field in California, and Buckley Field and finally at Bolling Field outside Washington, D.C. which was her home base from where she went to work each day at the Pentagon. At the time of her honorable discharge, Mrs. Price had attained the rank of sergeant. She was awarded a Good Conduct Medal, The AAF Technician Badge and the WAC Service Ribbon. Mrs. Price was a member of Holy Angels Catholic Church. She was in the Sweet Adelines, Wilson Memorial Auxiliary and FISH. She was a homemaker. A Mass of Christian Burial will be held on Friday, November 16, 2007 at 2:00 PM at Holy Angels Catholic Church with Rev. Gerald Bensman. Burial will be at Graceland Cemetery, Sidney. Friends may call at Salm-McGill and Tangeman Funeral Home on Thursday, November 15, 2007 from 3-7 PM. Memorial contributions may be made to the charity of one&#39;s choice.